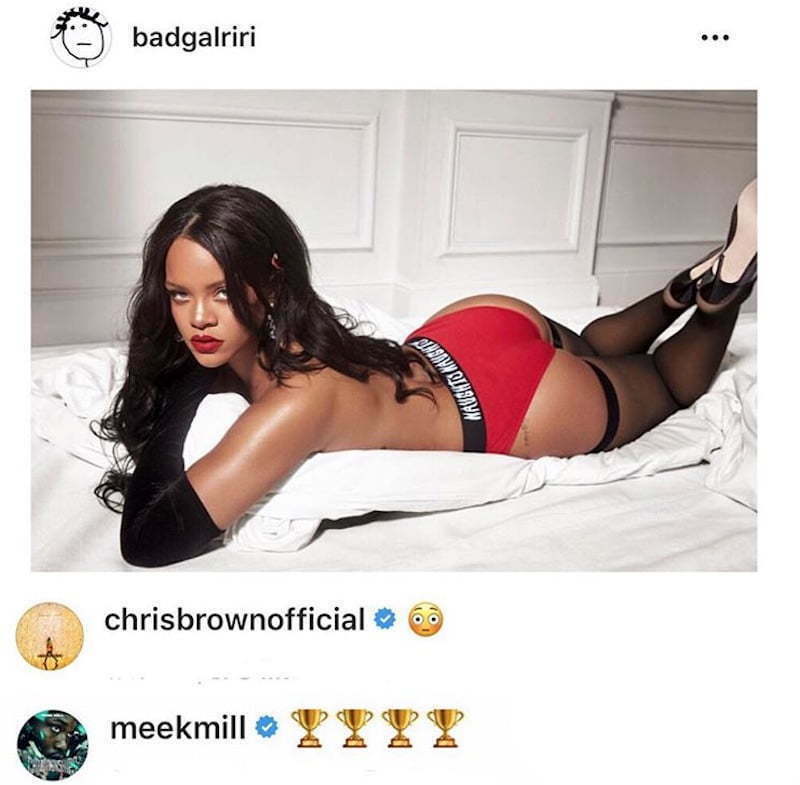 Chris Brown and Meek Mill are drooling over Rihanna’s underwear photo on Instagram. If you think that Chris Brown is over Rihanna think again after consuming this hot cup of tea. The pop star/fashion mogul is currently promoting her new line of Savage X Fenty underwear and lingerie so who better to model them than her. After posting one smoking hot photo on her Instagram page, @badgalriri, Brown left an emoji in the comment section. Not long after that, Meek Mill left four trophy emoji under the pic. Considering that both Breezy and Meek recently made peace with Drake who Rihanna broke up with last year. RiRi’s fans are now telling the “Fine China” singer to back off and leave the Bajan beauty alone. Rihanna fans, aka Navy, are very protective of her and just like the Beyhives, they will rip any and everyone to threads so don’t come for her. Chris Brown and Rihanna dated on and off for about five years before officially calling it quits. She then dates Drake on and off but then moved on from him to a Saudi billionaire name Hassan Jameel. A few years ago, some rumors were claiming that she had a fling with Meek Mill, but that was never proven.